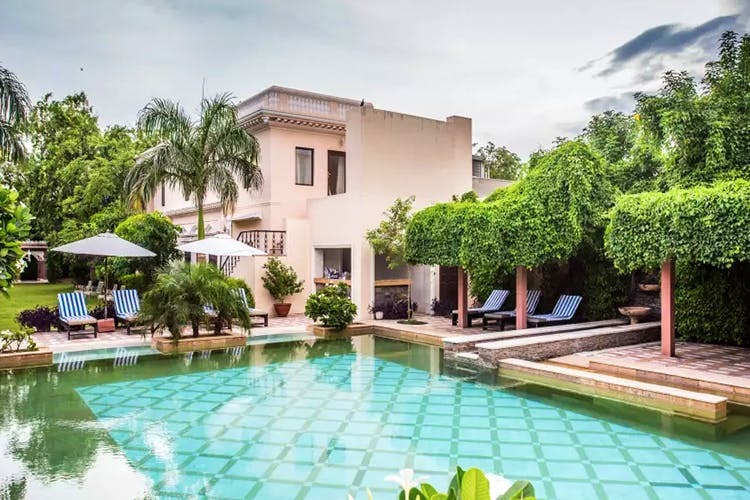 Royal Heritage Haveli By Niraamaya Retreats is a five-acre property in Jaipur that once used to be the hunting lodge for the city's royal family. Today, it's a cosy boutique hotel with a specialised wellness centre, and the most stunning bedrooms and service that'll make you feel at home. Weekend getaways, Ayurveda spa sessions, homemade Rajasthani meals. The moment we entered the Royal Heritage Haveli, we were greeted with the words 'welcome home'. It's proof of fact that you'll be welcomed and taken care of here like a family member. While their hospitality is something you'll go back home thinking about, it doesn't hurt that the place looks so pretty, and comes with so much heritage. This restored haveli opened to the public after 150 years with 19 suites, a restaurant, cafe, bar (Watermelon Gin cocktails FTW!) and a wellness centre. We love that this hotel isn't massive and has very few rooms, because you won't find crowds hogging the pool and the lawns, and it's perfect for a quiet (but luxe) vacay. Every room in this haveli looks different, but they're all spacious, decorated with intricate details (look at the ceiling!) and their bathrooms are one of the best we've seen in a while. Recently, the Niraamaya Retreats have collaborated with the folks at Royal Heritage Haveli. This means they have better spa and wellness services for you (try their Abhayangam Ayurvedic massage)! A game of croquet, lounging by the pool, stuffing your face with Papad ki Chutney and Narangi Mutton, are some of the many other things you can do here. You will need a taxi/private vehicle to reach the markets and touristy spots, as the Royal Heritage Haveli's at least a 20 minute drive from the main city. Leave from Delhi on a Friday morning (around 6am) for the Royal Heritage Haveli and you can easily get back on a Sunday afternoon, ready to take on a crazy Monday. Oh, and they've got two adorable beagles, Muffin and Zoya—be sure to say hi to them. Tariffs: Starting at INR 6,000/night.